CRAZY DISCOUNT! Was: $129.95 Now: $49.98! Keep your animals in or unwanted animals out with this Electric Fence Polywire-1000M! Perfect for small farms or fields where grazing occurs. The red and white colours offer high visibility keeping small kids or unsuspecting adults safe from shocks. 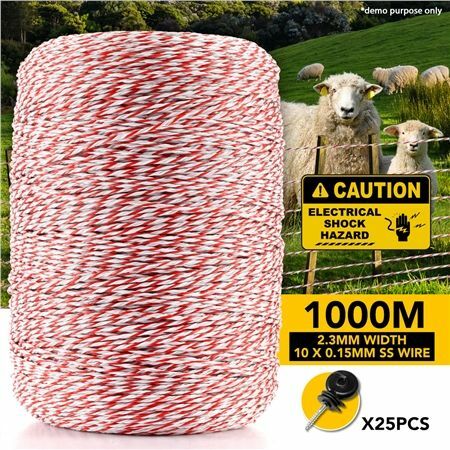 This electric fence wire is ideal for open fields, gardens or ranches! OMG That was fast postage. Thank you so much. Ordered the product and it was dispatched immediately and arrived promptly. Product supplied was exactly as described.